EXPERTISE & QUALIFICATIONS I love the real estate business. Having owned several Homes and Condos on the Treasure Coast, I understand the diverse marketplace and have a keen eye for value. Treating customers like family is both a guiding principle and a way of life for me. I specialize in helping with the many elements of the real estate process that can be complicated and daunting. I am a caring, intuitive, and results-driven professional, and I believe the key to making the real estate experience pleasant and rewarding for buyers and sellers is to listen carefully to each personâ&#x20AC;&#x2122;s needs and to provide them with the personal attention they deserve. ABOUT ME: Richard Zangre has been a Florida resident for over 20 years. Originally from New York, he moved to Florida with his family in 1993, seeking warmer weather and a safer community for his 2 children, Jennifer and Stephanie. Originally settling in the Coral Springs/Ft. Lauderdale Area, Richard was drawn to the Treasure Coast after his children graduated high school. Richard has owned and operated several businesses in his life and as a result he has become somewhat of a renaissance man. He has dabbled either professionally or personally in locksmithing, art, landscaping, interior design and remodeling, cooking, automotive electronics, marathon biking, photography and more. However, his most prestigious title according to him has been Dad. MY PROMISE TO YOU I am here to look out for your best interest and help you make good decisions. My job is not just to get your house sold, but to create a successful sale; to get you to the closing table on time, with the fewest amount of problems and with the most money in your pocket. In summary, my job responsibilities are to first share how to enhance your home, how to package it for profit and how to determine the best asking price. Second, to give your home total market exposure, create more demand, get more offers, make sure buyers are serious and qualified and make sure the transaction is worry free. Coldwell Banker Paradise is a full-service company based on integrity and putting you first. As your trusted advisor I am always looking out for your best interest. Your Coldwell Banker independent agent will guide you every step of the way making sure you know what to expect, answering your questions and helping you determine the right price to attract buyers and sell your home quickly. HISTORY The Schlitt Family has offered professional real estate services for three generations. Ed and Marguerite Schlitt opened Ed Schlitt Real Estate in 1953 serving Vero Beach, Florida. They were joined by their daughter Linda Schlitt Gonzalez in 1972 and by their son, Steven Schlitt in 1998. Linda’s son Andrew and her daughter Melanie have joined the firm. In 2013 they were joined by their sister Barbara Schlitt Ford who serves as Chief Operations Officer and Director of Legal and HR. Following the tradition of their parents, Linda Schlitt Gonzalez and Steven Schlitt presently co-own the company. They have grown the company into eleven offices covering over 135 miles along Florida’s east coast. 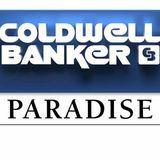 Now known as Coldwell Banker Paradise, the company has a sales force of over 280 sales associates and 48 staff to meet real estate needs for Stuart, Port St. Lucie, Fort Pierce, S. Hutchinson Island, N. Hutchinson Island,Vero Beach, Sebastian, Indialantic and Satellite Beach, Florida. GIVING BACK Because we believe that everyone deserves a home of their own, Coldwell Banker® founded the Homes for Dogs Project in partnership with Adopt-a-Pet.com.The project uses national advertising, social media and local adoption events to generate awareness and bring pets and people together. Since the initiative began in 2015, we’ve helped more than 20,000 adoptable pets find loving homes. To learn more, visit coldwellbanker.com/dogs. In 2017 Coldwell Banker Paradise participated in the Homes for Dogs project, working with local nokill shelters: Dogs and Cats Forever in St. Lucie County; H.A.L.O in Indian River County and Aloha Pet Rescue in Brevard County. With the help of the shelters we raised almost $8,500 and sponsored the adoption of almost 100 dogs and cats. Coldwell Banker Paradise also supports and promotes charity drives and sponsors many events on the Space and Treasure Coast including: local high school bands; Ocean Addiction Recovery Services; the Women’s Refuge; Think Humanity; Basket Brigade; Toys for Tots; Shrimpfest; the Sebastian Seafood Festival; Cause for Paws; International Coastal Cleanup; Save the Chimps; the Sebastian 4th of July Parade, the 4-H, Place of Hope and the Indian River Lagoon Council. LEADING THE WAY Coldwell Banker Real Estate practically invented modern-day real estate. Founded in 1906 on the principles of honesty, integrity and always putting the customer first, we changed the industry then and continue to do so today. Through non-stop innovation and forward thinking, the Coldwell Banker® brand has grown to become one of the most well-known and trusted names in real estate around the globe. Today, there are more than 92,000 agents working out of 3,000 Coldwell Banker offices in 47 countries and territories. 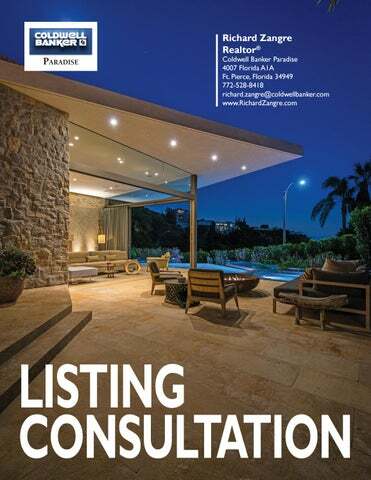 Wherever your home’s buyer might be, we’re there, too. LOCAL REACH We have 11 offices and over 280 affiliated agents all across our region actively bringing in buyers and creating more opportunities to showcase your home. on the most-visited real estate websites. Your home will be shown on multiple websites, including the most-visited real estate websites in the world, putting it in front of p buyers everywhere. Our comprehensive internet marketing strategy includes displaying your home with a detailed description a Your home willon bethe shown on multiple including the most-visited real estate websites in the world, putting it in front of multiple photos most-visited realwebsites, estate websites. buyers everywhere. Our comprehensive internet marketing strategy includes displaying your home with a detailed description multiple photos on the most-visited real estate websites. iple websites, including the most-visited real estate websites in the world, putting it in front of potential estate websites. hensive internet marketing strategy includes displaying your home with a detailed description and ed real estate websites. be shown on multiple websites, including the most-visited real estate websites in the world, putting it in front of potential here. Our comprehensive internet marketing strategy includes displaying your home with a detailed description and on the most-visited real estate websites. Once a potential home buyer is on my Zap platform, I can focus my efforts and resources on those who are poised to purchase. CBx BUYER PROFILE For your home’s marketing to be effective, it needs to reach the right audience. That’s where CBx comes in. An innovative tool developed exclusively for the Coldwell Banker® network, CBx uses big data to analyze your market, your neighborhood and more—then presents a profile of the most likely buyer for your home. PRINT ADVERTISING While online advertising remains the most effective way of reaching home buyers today, in some instances it may be beneficial to incorporate print advertising as well. We have relationships with key regional and local publications that enable us to showcase your property in the most effective way and generate maximum interest. PRICING RIGHT While you and your agent will set your home’s asking price, the buyer will set the sales price. If you price your home too high, you’ll miss out on potential buyers. Pricing your property at fair market value from the start will generate the most activity from real estate agents and home buyers. The price must attract enough attention to result in showings and offers. FIRST IMPRESSIONS The largest number of potential buyers will view a newly listed home within the first 14 days on the market, and the number will decrease as the days on the market increases. This pool of buyers includes home buyers just entering the market and, more importantly, buyers working with Realtors® who have already seen the existing inventory and have not found a home, making them eager to make an offer. To take advantage of this increased level of traffic and buyer interest, your property should be priced to sell at fair market value from the very start. COLDWELL BANKER SMART HOME Coldwell Banker Real Estate is always finding new ways to market and sell homes, and has become the dominant real estate force in the rapidly growing smart home arena. Why does this matter? According to a recent Coldwell Banker Real Estate Smart Home Marketplace Survey, nearly half of consumers surveyed think smart home technology is important for their current home or next home purchase, and 60% said they would be willing to pay more for a home with smart home tech installed. Not only that, 33% of Coldwell Banker® affiliated agents surveyed said homes with smart home technology sell faster than those without, and homes designated as smart homes on coldwellbanker.com receive two times the conversions of similar non-smart home properties*. It’s a meaningful trend, and we got there first. Among our smart home innovations: • In collaboration with tech giant CNET, established the industry standard definition of the term “smart home.” • Created the first-ever smart home certification course exclusively for Coldwell Banker affiliated agents. • Developed the industry’s first Smart Home Staging Kit, giving sellers an easy and affordable way to upgrade their home to a smart home. *Coldwell Banker Real Estate Smart Home Marketplace Survey: A conversion in this instance is a click-through requesting more information on the property from an agent or a request for an appointment to view the listing. SMART HOME STAGING KIT A recent survey conducted by the Coldwell Banker® brand and CNET indicate that homes with smart technology are selling faster than those without. AMAZON ECHO DOT The Echo Dot is a hands-free, voice-controlled device that uses Alexa to play music, control smart home devices, make calls, send and receive messages, provide information, read the news, set alarms, read audiobooks and more. Control lights, fans, switches, thermostats, garage doors, sprinklers, locks and more with compatible connected devices; such as those from August, Nest and Lutron. NEST LEARNING THERMOSTAT The Nest Learning Thermostat programs itself and automatically helps save energy when you’re away. And you can control it using your phone, tablet or laptop. NEST CAM INDOOR (SECURITY CAMERA) Nest Cam Indoor helps you stay connected to what matters to you. It looks for motion and listens for sound. If something’s up, it sends an alert to your phone. AUGUST CONNECT Lock and unlock your August Smart Lock from anywhere, right from your smartphone. Accessory to August Smart Lock. NEST PROTECT(SMOKE AND CARBON MONOXIDE ALARM) The Nest Protect looks for fast-burning fires, smoldering fires and carbon monoxide. It tells you where the danger is and alerts your phone in case you’re not home. AUGUST SMART LOCK Your smartphone is now a smart key—and more. Lock and unlock your door, create virtual keys for guests, and keep track of who comes and goes all from your smartphone. CASÉTA WIRELESS BY LUTRON Simple products that control lights and wireless shades. Provides solutions to real, everyday problems. • Never enter a dark home. Turn lights on as you approach your home from your phone—great for showings! • The movie begins when the lights start to dim. • Set the perfect light and ambiance to show the house in its best light. • Don’t get out of bed to turn the lights off at bedtime. The Pico remote can turn lights off right from your night stand. MARKET ANALYSIS What is your home worth in today’s real estate market? With the way things are up and down - it can be difficult to know. There are websites that can give you an “estimate,” but those can be off by thousands of dollars. The only way to get an accurate figure of the value of your home is to consult with a professional Real Estate Agent. I have the tools, the knowledge, the experience. Give me a call today and together we will determine how much your home has appreciated in value since the last time you checked. CB DISCLAIMER: © 2017 Coldwell Banker Real Estate LLC. All Rights Reserved. Coldwell Banker Real Estate LLC fully supports the principles of the Fair Housing Act and the Equal Opportunity Act. Each Office is Independently Owned and Operated. Coldwell Banker and the Coldwell Banker Logo are registered service marks owned by Coldwell Banker Real Estate LLC. Each sales representative and broker is responsible for complying with any consumer disclosure laws or regulations. Coldwell Banker Paradise: Real estate agents affiliated with Coldwell Banker Paradise are independent contractor agents and are not employees of the Company. ©2017 Coldwell Banker Paradise. All Rights Reserved. Coldwell Banker Paradise fully supports the principles of the Fair Housing Act and the Equal Opportunity Act. Operated by a subsidiary of NRT LLC. Coldwell Banker and the Coldwell Banker Logo are registered service marks owned by Coldwell Banker Real Estate LLC.